The main difference between cytotoxic T cells and helper T cells is that the cytotoxic T cells destroy virus-infected cells and tumor cells whereas the helper T cells secrete cytokines to activate or regulate other cells in the immune system to trigger a specific immune response. 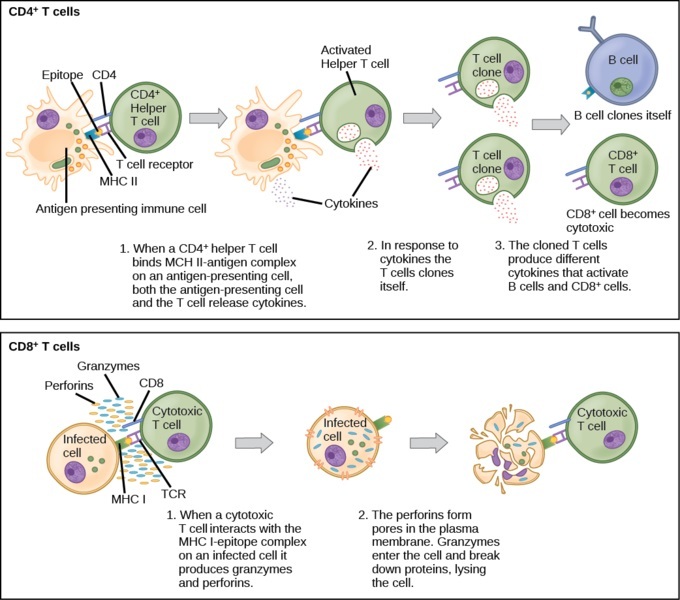 Furthermore, cytotoxic T cells are involved in cell-mediated immunity while helper T cells serve as antigen presenting cells to activate B cells. Cytotoxic T cells and helper T cells are two types of T lymphocytes in the immune system. Both types of T lymphocytes emerge in the bone marrow and mature in the thymus. Cytotoxic T cells (TC cells) or T-killer cells are a type of T lymphocytes responsible mainly for the destruction of virus-infected cells and tumor cells. Tumor cells emerge in autoimmune diseases and they can cause transplant rejection. The type of T cell receptors (TCRs) found in cytotoxic T cells are CD8 receptors. These receptors can recognize antigens presented with MHC class I molecules. The infected cells by viruses present the viral antigens along with the MHC class I molecules on the cell membrane of the infected cells. Cytotoxic T cells then recognize antigens and induce the destruction of those cells, either through apoptosis or degranulation. Here, cytotoxic T cells send proteases and enzymes to the infected cells through a microtubule cytoskeleton. On the other hand, another type of T cells called regulatory T cells secrete IL-10, adenosine and several other anti-inflammatory cytokines to activate cytotoxic T cells, reducing the severity of autoimmune diseases. Helper T cells (TH cells) are another type of T lymphocytes in the blood. The main function of helper T cells is to activate or suppress other cells in the immune system through cytokines. 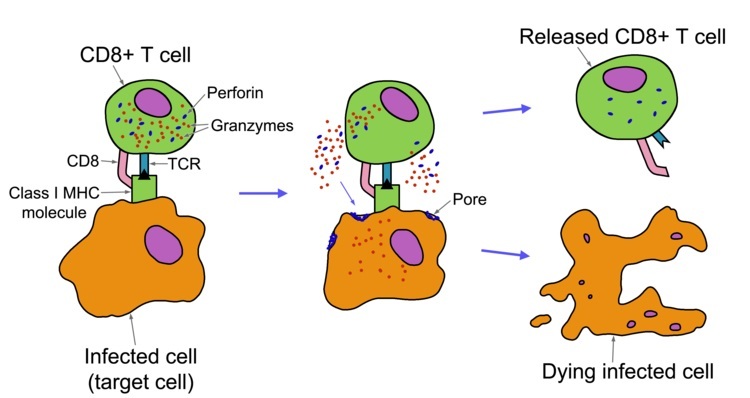 In addition, helper T cells serve as antigen presenting cells to B cells, activating them to produce antibodies specific to a particular pathogen. CD4 receptors are the type of T cell receptors in the helper T cells. These receptors can recognize antigens presented with the MHC class II molecules. Antigen-presenting cells including macrophages, neutrophils, dendritic cells, etc. present the antigens to the helper T cells along with the MHC class II molecules, activating the helper T cells. Once activated, helper T cells proliferate rapidly and secrete cytokines including certain interleukins and IFN- γ. Also, there are several types of helper T cells including TH1, TH2, TH3, TH17, and TFH. Moreover, the type of cytokines secreted by the helper T cells depend on their type. Cytotoxic T cells and helper T cells are two types of T lymphocytes found in the blood. Both of them are a type of white blood cells differentiated from the common lymphoid progenitor cells in the bone marrow. Also, the maturation of T cells occurs in the thymus. Furthermore, both contain a specific type of T cell receptors, which help in the identification of pathogens. Besides, both are involved in the adaptive immunity since their immune response is for a specific pathogen. Cytotoxic T cells refer to a type of immune cell that can kill certain cells, including foreign cells, cancer cells, and cells infected with a virus. Whereas, the helper T cells refer to a type of T cell that provides help to other cells in the immune response by recognizing foreign antigens and secreting cytokines that activate T and B cells. Thus, this explains the main difference between cytotoxic T cells and Helper T cells. Another difference between cytotoxic T cells and Helper T cells is that the cytotoxic T cells contain CD8 receptors while helper T cells contain CD4 receptors on the cell membrane. Moreover, virus-infected cells and tumor cells present antigens to cytotoxic T cells while macrophages, dendritic cells, neutrophils, etc. present antigens to the helper T cells. Hence, this is another difference between cytotoxic T cells and Helper T cells. Furthermore, CD8 receptors of cytotoxic T cells can recognize antigens presented with MHC class I molecules while CD4 receptors of helper T cells can recognize antigens presented with MHC class II molecules. Another significant difference between cytotoxic T cells and Helper T cells is that the cytotoxic T cells destroy virus-infected cells and tumor cells while the helper T cells secrete cytokines to regulate other cells in the immune system and present antigens to the B cells. Cytotoxic T cells are a type of T lymphocytes responsible for the destruction of virus-infected cells as well as tumor cells. On the other hand, helper T cells are another type of T lymphocytes responsible for the secretion of cytokines, which regulate the other cells in the immune system. 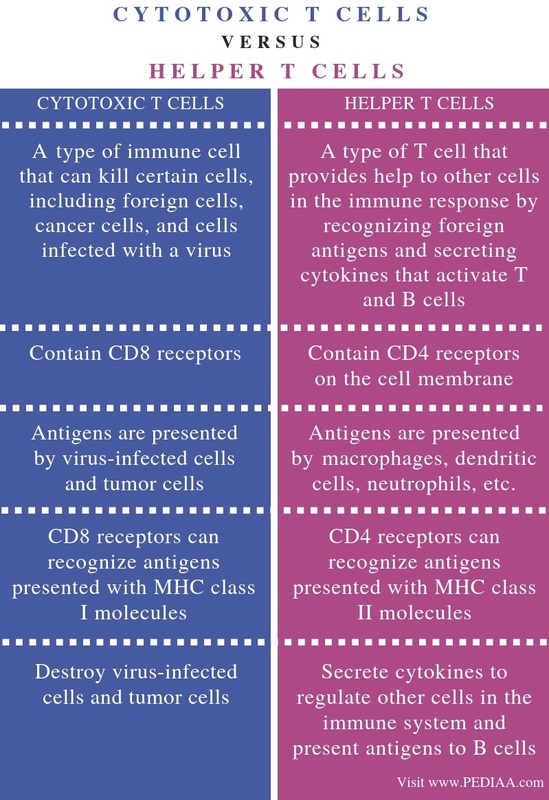 In addition, cytotoxic T cells have CD8 receptors, which can recognize antigens presented along with MHC class I molecules while helper T cells have CD4 receptors, which can recognize antigens presented with MHC calls II molecules. The main difference between cytotoxic T cells and Helper T cells is the type of T cell receptor and their role in the immune system.